What is Shop San Vicente and Small Business Saturday? Small Business Saturday is an American shopping holiday held on the Saturday after Thanksgiving. It was first observed in 2010. • Who is organizing Shop San Vicente? The San Vicente Business Association is working to organizing the inaugural Shop San Vicente this year! • Why is Shop San Vicente being organized? SVBA is organizing Shop San Vicente in an effort to support local shops and restaurants that make our Brentwood community strong. • What are the hours of Shop San Vicente? From 10:00 am – 2:00 pm on November 24, 2018, SVBA is working to organize activities for children and hire street performers along San Vicente Blvd. Shops and restaurants are encouraged to hold activities, sales, giveaways etc. during those hours. • Why should I get involved? A successful Shop San Vicente will allow you to achieve goals such as growing your customer base, achieving higher foot traffic, or becoming better known throughout the Brentwood community. • What can shops and restaurants do to get involved? 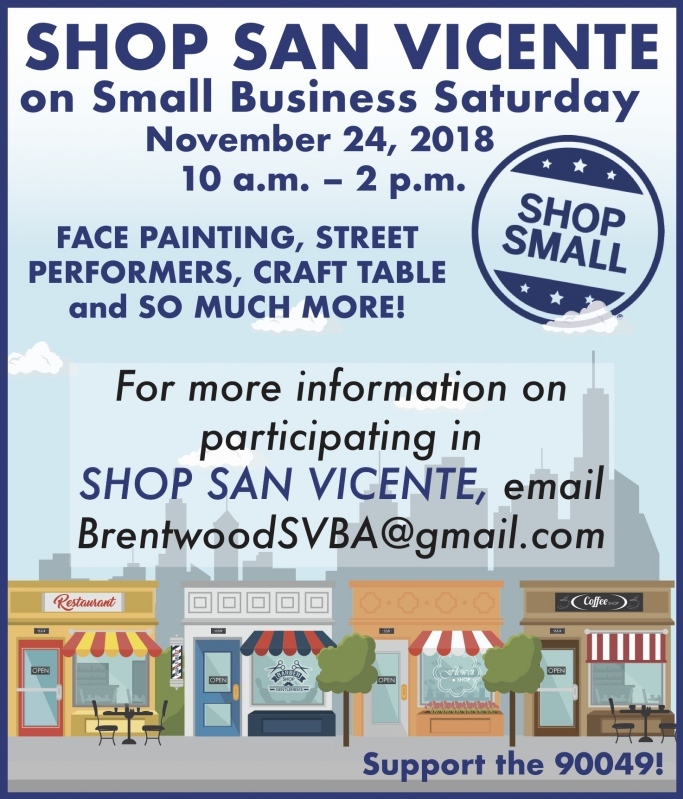 To participate, SVBA is asking each business to hang a poster in its store front to indicate it is a SHOP SAN VICENTE vendor and let us know what you would like to do on November 24th. Ideas include hosting an activity in your store, offering samples, discounts or free gifts, providing free consultations or giving discounts off of future services for referrals of a friend. Please contact us at the email below as soon as possible to ensure best publicity for your business. Sponsors and other volunteers are also needed so please forward this information to other businesses, your colleagues and friends! To learn more or to sign up to participate, please e‐mail BrentwoodSVBA@gmail.com. Thank you!